— Ideal MHD modes. The most serious instability predicted in FRCs is the internal tilt mode which breaks toroidal flux surfaces and corresponds to the kink mode in a z-pinch (for small plasma elongation the external tilt mode, which produces a flip in the plasma axis, may also be unstable). No observation of the internal mode has so far been reported. — Tearing modes. Tearing modes are observed during the formation phase but the subsequent equilibria appear to be stable (unaffected by them). — Rotational modes. Following the formation phase, the plasma starts to rotate in the ion diamagnetic direction. Although the origin of plasma rotation is not fully understood, it is clear that rotation causes new instabilities. The most dangerous is the n = 2 rotational instability that can destroy the configuration. A threshold in the ratio a = O/ODi (with O the rotation frequency and ODi the ion diamagnetic rotation frequency) in the range a « 1.5 is predicted by theory. The mode is suppressed by applying a multipolar field by external coils with straight or helical windings. — The parameter S (the number of ion gyro-radii between the field null and the separatix) is of the order S ~ 1-2 in current experiments. Under these conditions several kinetic effects can play a stabilizing role: orbit width comparable with the perpendicular mode wavelength, diamagnetic frequency comparable with the Alfven growth rate, and finite plasma compressibility. Note also that the MHD model is not adequate in this limit. Thus, the most important question is whether FRCs will also remain stable in reactor-relevant conditions with projected values of S in the range S = 30-40. — The low-beta open-field region is MHD-stable because of the favorable curvature of the magnetic field line at the end of the configuration. This effect can help in stabilizing the FRC core. — The presence of a conducting boundary and of toroidal rotation may also play a stabilizing role. There is not yet quantitative agreement between experimental results on FRC stability and theoretical analyses, although the role of kinetic effects is widely recognized. Thus, extrapolating to a next generation of FRC experiments is still not possible. However, since the requirement for larger S (for better confinement) conflicts with the requirement of bulk plasma stability, it is clear that additional stabilizing mechanisms should be investigated. For example, it has been suggested that production of an energetic ion ring, by injecting energetic ions carrying most of the equilibrium current, would at the same time provide both a stabilizing mechanism and a means of sustaining a steady-state configuration. This approach has already been used in the ASTRON device and in field-reversed mirror experiments and is currently proposed for the Colliding Beam Fusion Reactor (CBFR) discussed below [Rostoker et al., 1993]. Figure B.16. The three steps of the FRC-based MTF approach (from Taccetti et al. ). Formation. The 0-pinch formation sequence produces FRCs on a timescale of a few Alfveen times, and would imply large pulsed power when extrapolated to a reactor. So-called slow 0-pinch formation schemes aim at forming the pinch in times of order of the resistive timescale. This scale is a few orders of magnitude longer than the Alfven time. Means of achieving slow formation of the pinch may consist of a Coaxial Slow Source, Rotamak, Extrap, or the Field Reverse Mirror. These methods are described in [Tuszewski, 1988]. That they can be extrapolated to reactor conditions must be proved. An interesting feature of FRCs related to their stability is the possibility of translating the configuration along the symmetry axis away from the formation region through a weak gradient in the axial field. This property allows better adiabatic compression heating and physical separation of the high-technology formation chamber from the burn and quench chambers. This possibility is particularly interesting in the context of the so-called "magnetized target fusion'' approach [Siemon et al., 1999]: the FRC is translated inside a metallic liner which is then imploded on a microsecond timescale [Taccetti et al., 2003]. This approach is intermediate between the magnetic and inertial confinement schemes and is illustrated in Figure B.16. Sustenance. In present experiments the lifetime of the configuration depends on the rate at which the magnetic flux ^ initially trapped is dissipated. In order to maintain the configuration in steady-state conditions several methods have been proposed and need to be tested: rotating magnetic fields (tested only in cold plasmas), neutral beam current drive, and spheromak merging. — In the case of a rotating magnetic field (RMF) current drive, a small rotating transverse field component is generated by oscillating currents driven in longitudinal conductors located near the wall. Under certain frequency and collisionality conditions, the transverse field penetrates the plasma and drives an electron current in a manner similar to an induction motor. This method has been proven only in cold devices called rotamaks. Experiments are ongoing to demonstrate its applicability to hotter plasmas. — Neutral beam injection experiments could sustain the configuration for times much longer than 1 ms. Injection of 100 A, 30-60 kV beams would also induce a rotation with velocities of the order of the Alfven velocity. As already noted, beam particles could also play a stabilizing role. This approach, also used in the CBFR, has been used for field-reversed mirrors. — Spheromak merging has been shown on TS3 to produce an FRC configuration if the two spheromaks have opposite helicity. Transport. Turbulent transport has also been observed in FRC. Turbulence affects not only cross-field particle and energy transport, as in tokamaks, but also the decay of poloidal magnetic flux (anomalous resistivity). In the scrape-off layer anomalously slow particle outflow has also been detected. Some understanding exists for cross-field particle/energy transport which is consistent with the expectations of low-frequency drift wave turbulence. Several small-scale instabilities have been considered: lower hybrid drift instability, the microtearing modes driven by the electron temperature gradient, and the Kelvin-Helmholtz instability driven by shear. Classical losses associated with unconfined particles in velocity space (as in the simple mirror configuration) in the region close to the separatrix have also been proposed. 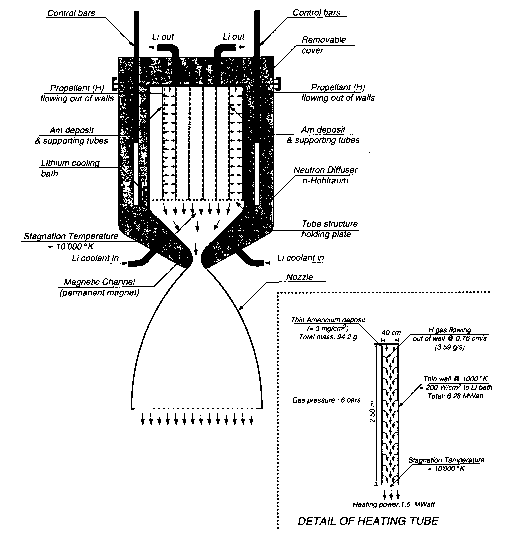 The present diagnostic capabilities allow determination with reasonable accuracy of the particle confinement time tn. Particle losses appear to account for 60%-80% of the energy losses, the remainder being associated with radiation and thermal conduction. The measured tn is in the range 10 ms to 200 ms, scaling linearly with the parameter R2/pie (as shown in Figure B.17) with rs = 21/2R. Figure B.17. Scaling of particle confinement time. low as 3. 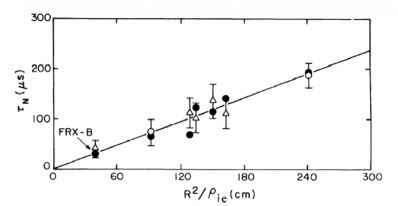 As to the characteristic decay time of the poloidal flux, the comparison between the experimental value and that derived from classical Spitzer resistivity shows a discrepancy ranging between 2 and 20, showing the presence of substantial turbulence effects. Finally, we note that changes in the turbulence regimes (and therefore in global transport) may be expected for the FRC at larger values of S.
Technology. A research program is presently being pursued in a joint University of Washington/Los Alamos National Laboratory effort, to develop the best method to generate rotating magnetic fields, including: (1) the design and construction of a suitable high-power RF source and drive coils capable of a sustained pulse longer than 1 ms; (2) demonstration of the RMF technique in a plasma column of moderate size (0.5 m diameter and 1.5 m length); (3) investigation of alternate methods for generating the RMF that are more efficient and capable of delivering higher power.